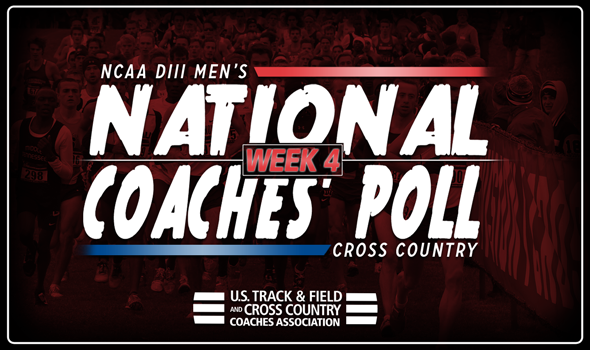 NEW ORLEANS – Parity is the name of the game in the most recent NCAA Division III Men’s Cross Country National Coaches’ Poll that was released Wednesday by the U.S. Track & Field and Cross Country Coaches Association (USTFCCCA) as seven of the eight regions are represented in the top-10. The Midwest Region is home to four of those top-10 teams, while the Atlantic Region has two and there is one each from the Great Lakes Region, Mideast Region, New England Region, South/Southeast Region and West Region. North Central (Ill.) proved itself worthy of the No. 1 ranking this past weekend when it demolished the field at the Illinois Intercollegiate Championships. The Cardinals swept the slate clean as Dhruvil Patel, Jared Borowsky, Dan O’Keefe, Zach Hird and Al Baldonado went 1-2-3-4-5 with a 17-second spread between them. SUNY Geneseo cruised at its own Mike Woods Invitational and remained at No. 2, while UW-La Crosse posted a convincing win at the Blugold Invitational and moved up to No. 3 for the fourth time this season. Haverford jumped from No. 9 to No. 4 – its best ranking since 2013 (No. 2) – following a huge performance at the Paul Short Run. The Fords finished 17th and were the top NCAA DIII team in the Gold Race by 190 points (Amherst finished 25th). Perhaps the most impressive thing about Haverford’s outing was that it knocked off a number of NCAA DI programs as well as NCAA DII ranked teams Mount Olive and American International. Washington (Mo.) stepped back into the top-10 for the first time since Week 5 of 2015 thanks to a dominant effort at the Millikin H.W. Wright Classic. The Bears received the individual win from David O’gara but didn’t stop there as they put runners in every spot from No. 2 through No. 10. Further down in the index, UW-Stout comes in at No. 19 and is one of five programs either making a return to the top-35 or joining it for the first time this season. The Blue Devils finished a close third at the Blugold Invitational behind UW-La Crosse and now 13th-ranked UW-Eau Claire, while new No. 27 UW-Platteville took fourth. Ohio Northern returned to the poll in a tie for 24th with Rhodes, NYU went from unranked to No. 33 and Lewis & Clark is new at No. 35. We should see similar movement in the poll that will be released October 18, because it comes right after the Pre-National Invitational in Elsah, Illinois. Exactly one month later, the 2017 NCAA Division III Cross Country Championships will be held on that same course.